I haven’t watched any films in the past week or so because I’ve been busy scanning old family photos. It’s been on my to-do list forever (or would be if I had one). A lot of the photos are faded and discolored (my baby pictures are getting close to 50 years old! *yikes*) and I want to preserve them before they get worse. I rant on about neglected Hindi cinema history so I’d best not neglect my own! Of course it may not be of much interest to most of you (although there is something strangely compelling about family albums, isn’t there?) so forgive me for this small digression (I won’t be offended if you skip it altogether). She also has a certain gift with words on occasion, so I’m sharing her commentary where applicable. My dad is ill now, in the middle stages of dementia, and it’s hard to see a man who was always reading, studying, teaching—who knew everything it seemed—struggling to find words, or meaning, or his walker (he refuses to get back in the wheelchair!). This photo, and the note on the back, brought tears to my eyes. I’m never sure which one is happiest. 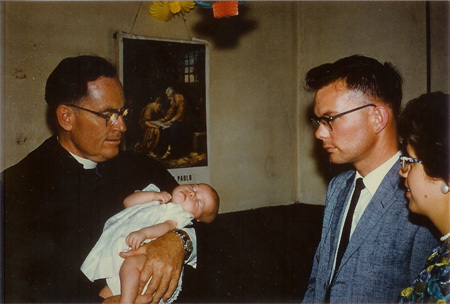 The one below was taken when I was baptized by Bishop Dodge (holding me). I crack up every time I see it at how completely dead asleep and limp I am. It may have been the first time I fell asleep in church, but it certainly was not the last. 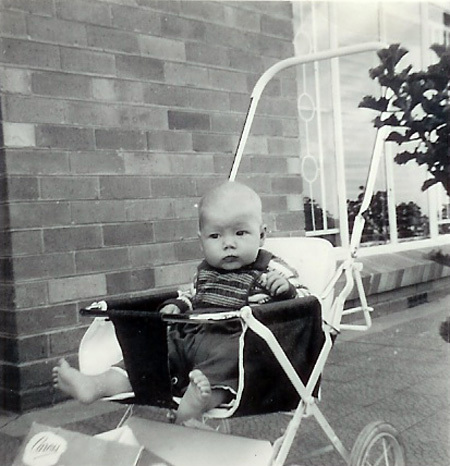 Our favorite stroller to survey the world from and those eyes miss very little. The halcyon years of being the center of the universe didn’t last long. Here I am being lulled into a false sense of having any say in anything having to do with my little brother Dave being born. My mother had clearly not started nagging me to keep my legs together yet. Gotta admit, though, the little guy was cute. Taken on our front porch. Before puppy got sick. Greta gets that look on her face now when she sees the camera. David just enjoys life. I’m guessing the puppy didn’t make it (I’m also betting it was already sick, judging from the way it let me plop it face down on my lap). Many of our childhood pets didn’t get very old. Hey—we lived in the African wilderness! Who wants expensive toys? Just give us the grocery box! 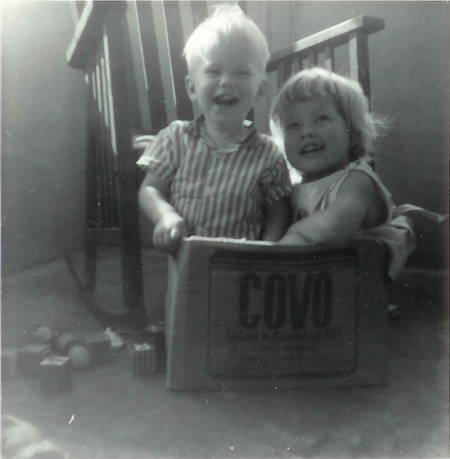 We played with cardboard boxes for years. When we couldn’t both fit in the same one any more we made trains and my sister, after she arrived, was always the caboose. One of our favorite pastimes. Greta also likes to draw circles and more circles. David would just as soon color the walls. 1964. Mommy’s little helpers (?) In our kitchen. A sink for each one. I love my mother’s question mark after “little helpers”…that is signature Mom. She could never quite understand why little toddler fingers didn’t do the job as well as her grown-up ones. The main thing I remember about this kitchen is that it was painted bright turquoise. BRIGHT. …This is our front lane. Needless to say – we filled in this hole with dirt after this. They looked like this all the time at Kitwe. This was taken in Kitwe (Zambia). 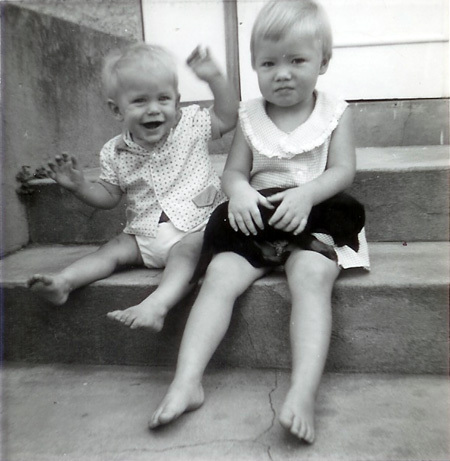 My sister made her appearance in 1966. She makes her way onto these pages too, now that she lives close by and is ever willing to watch fillums with me. Christmas morn 1966. Each kid had a sock. Marta already opened hers and the other two were busy. Then next was breakfast. The dress I have on was one I had just made. 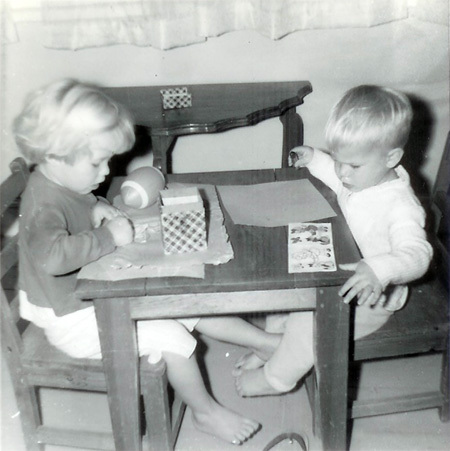 This is so typical of David & Greta sitting together. Usually they are talking too. So sweet! We still talk a lot when we get together. And laugh even more. Mom and Dad were pretty mad when we dug this hole in our drive, right where guests were supposed to park (note the presence of the cardboard box). One of them took a photo, though, before they made us fill it back in. So there you have it: the childhood of the Memsaab, replete with a lot of mud and dirt, short-lived pets, bad haircuts, cardboard boxes and usurping siblings. Posted on October 19, 2009 at 6:33 pm in Everything else	| RSS feed You can skip to the end and leave a reply. How wonderful! 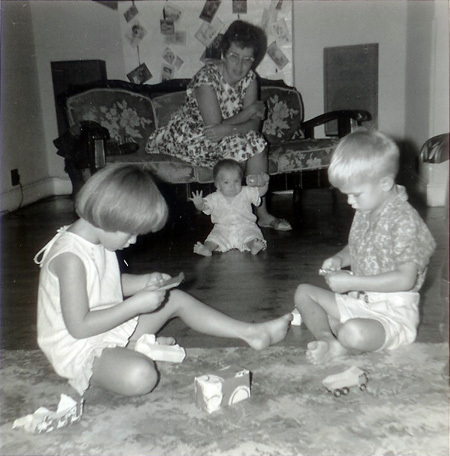 I wish all the blogs I visit would do a day of old family photos, it is so much fun to see and learn more about the people we interact with via the internet…and those pics of yours, Greta, warmed my heart, and I loved the inclusion of your mom (and dad’s) written remarks. So does that mean Pedro’s parents will be making an appearance? Or yours? :-) I’m glad you liked it. I spent a couple of days wrapped in a warm fuzzy feeling. Am so lucky to have been born into my family…we didn’t have much money, but we had a lot of FUN, and so many rich experiences. ps2: your mom is soo sweet! her “I’m never sure which one is happiest” made me tear up a bit too! i think because it reminded me of my own childhood days with me & my dad. & ps3: lol, oh i think your parents are so cool! ref: the last pic. most parents would just be mad; they won’t bother about taking a pic!! My parents are so cool. Always have been. I’m glad you enjoyed this with me :))) Thanks. I agree with Ranya. Definitely the most beautiful post!! Your childhood also seems very beautiful, if you can understand why I’m describing it as such. I am sure that a large part of my feeling really happy in India is because it resonates with some of my childhood memories. Lovely. The pictures are simply precious. I used to love cardboard boxes as well. In fact I collected empty matchboxes and made stuff out of them. Even Now, my heart breaks when I have to throw out shoe boxes. I know! African childhood = super sweet. 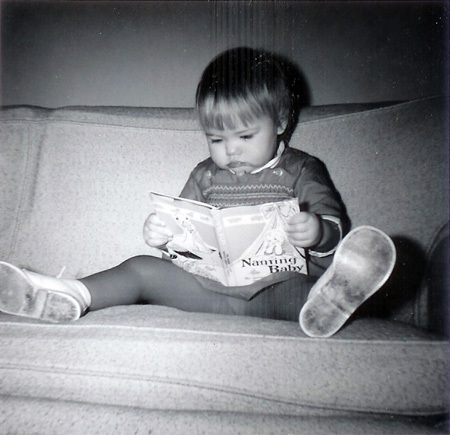 I was a cute toddler, it’s true…but the 70s were not kind to me :) None of those photos will be forthcoming! We were into sand and mud ourselves…so appreciate your holes! I never threw away any box that came with a toy for my kids: they got a whole lot of fun out of it before it broke down under the strain. Interestingly, my sister (who is doing her Master’s in Fine Art) is painting dots these days. Hmmm. 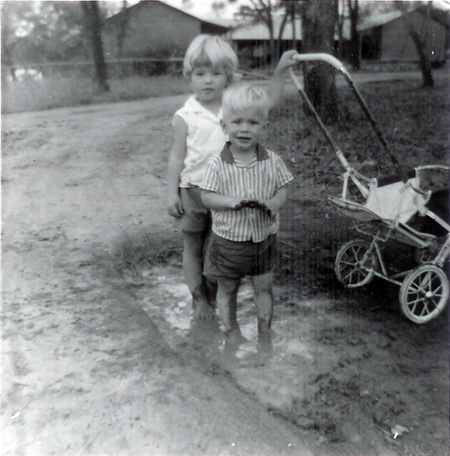 My brother and I even made mud pies and ate them. I honestly think that I never get sick in India, despite being much less paranoid than people would like, because of all those African antibodies I ingested as a child. hope you don’t mind me saying, but when I saw that 1st pic of your parents I thought your mum was a very young Billie Jean King. I have also discovered another thing we have in common apart from a love of Hindi Films – the Mark I Cortina ! That was our 1st car back in England in the late ’60’s. 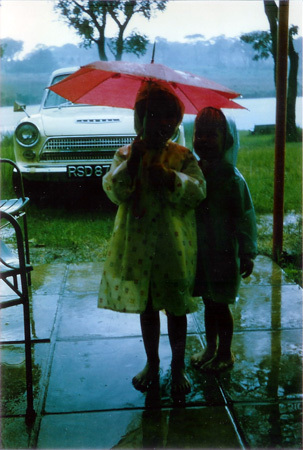 We had that Cortina forever. I remember sitting in it for hours :))) It had a blue stripe on the side too as I recall. Lovely pictures and lovely write up. Indeed this is the best post of the blog. When I watched the fist photo, it was like “back to the future” pt I where the hero goes from 1980s into 1950s and watches his parents. 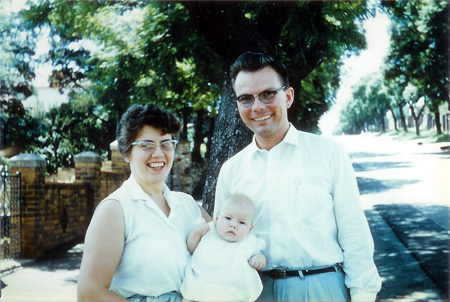 The first picture shows your parents looking so much like a typical 1950s couple with the 1950s hairstyle and dresses. When I watched the baby in her mom’s arms, I immediately recognised it as Greta. That was before I had looked at the title of the post carefully. I can see that you have got your ear to ear smile from your mom. Also, your mom then looked quite like you. You going to sleep in the arms of the Bishop is hilarious. Bishop and mom look amused but the father looks embarrased. Playing with mud and being taken to task by the parents- so the world is a small place after all. I must say that there are not too many parents who are careful enough to have a camera ready to click pictures like these. And there are not too many parents who would be sentimental enough to keep old memorablia intact for future reference. That way it is so nice of your parents to take these lovely pictures and reatined them. The pictures certainly speak volumes about a happy a close family. Discussing old movies, old songs etc ( that you as well as I do), I have realised that every person has about 30-40 years in this world when he is at his prime. 30-40 years ago our parents were chronologically in exactly the same stages in their lives in which we find ourselves today. 30-40 years from now, our kids will be in the same stage in which we are there today. This cycle will continue. Ability to look back into the past with the help of photographs and other such memorablia is a lovely convenience that humankind did not always have. I thank you a lot for this lovely post full of nostalgia. I absolutely loved going through this post and the photos. Just wonderful. I realize reading your comment that I didn’t include any photo of my dad smiling—I actually have HIS smile, it’s even wider than my mother’s. My siblings have it too. I do look very much like my mother now though. I think the reason so many of these photos were taken and have survived is because of the distance between us and my mom’s family—she was diligent about writing to her mother (as she likes to remind me) and sent many pictures etc. with anecdotes on the back of them. My grandmother saved them, and I snagged a lot of them when she passed away. I adore all your pictures – from Mommy’s little helpers (you’re looking especially cute there!) to the grubby twosome in that lane in Kitwe. Just looking at your photos gave me a warm and fuzzy feeling! I now have an idiotic grin on my face and a resolve that someday I’m going to dig out my old photos and have a look at them again! I gave my mother some grief about the question mark last night on the phone. She was laughing. One of her constant refrains was: “If you want something done right, do it yourself!” (while redoing whatever it was we had done for her). This was so much fun–more more more!!! hahaha, I think it just means you both grew up in remote places–her in rural MN, you in Rhodesia– shockingly similar, I’m sure. Not as far off as you might think. No Toys ‘R Us, anyway! Parents during their childhood photos would be most welcome! What fun that would be to see. I grew up in the 70s also, Greta…so I know EXACTLY what you mean! Oof, the 80s were not any better. Talk about scary pictures. Be careful what you ask for, LOL. My mom had such an “Americana” childhood—on a farm in Ohio. The 80s were bad too, I agree, but at least adolescence was over (at least for me)…but I just think of it as a period of shoulder pads and big hair (although I never got on board the big hair thing). Really cute! I have a similar album in my Facebook profile called ‘Sepia’ (it’s a tad monotonous though – I am an only child). And now I know your name! Oh no, not at all! :-D I kind of meant it in the “finally I know the name of the lady who’s a Shammi fan like me and writes wonderful reviews with cliffhangers” way. ;-) That’s what I figured! Shammi zindabad! What lovely pictures!!!! I treasure all the old family pictures that I have and am also in the long process of scanning everything. Through reading your blog, I already felt like I knew you but this really gives another dimension to that knowledge. It puts another perspective to your writing. It’s wonderful that you are brave enough to share this with the world. Thanks Suzanne, for both your sweet comments :) Aren’t we lucky to be able to scan them? And as Atul pointed out, that we even have them to scan? I’m glad people have enjoyed reading this, I just felt like wallowing for a bit. Having a blog is so very self-indulgent!!! 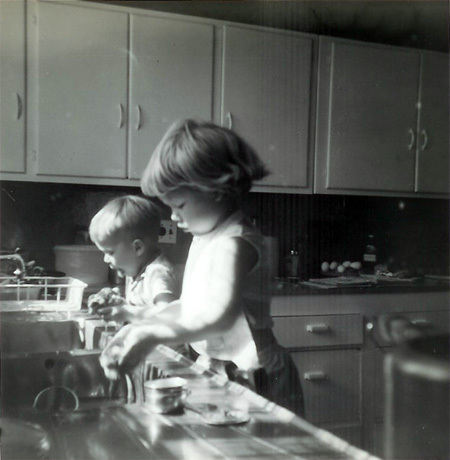 Love all these pictures – they are so cute, AND such beautiful windows into the past. More such pictures, please! The first picture is of your Dad smiling, and I agree that you inherited his smile. 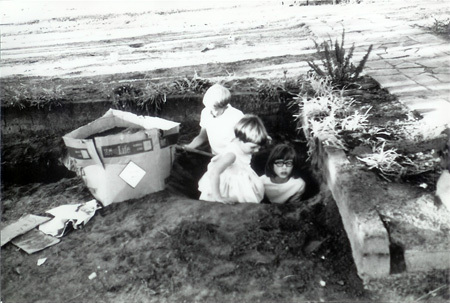 And you were so lucky to be allowed to play in the dirt (kiddie heaven)! I cant remember a single instance of that from my childhood – but then we lived in urban jungles, for the most part, with no gardens or trees in our backyard. Our play usually consisted of making a “house” in a tent of sheets slung over chairs and wearing Mom’s discarded dupattas as “saree”! Allowed to play in the dirt? We were FORCED to play in the dirt. “Go outside and play!” my mom would yell when we got on her nerves (usually by 8:30 am). Then she’d yell at us when we came in all dirty. I am sort of joking (not really) but we were grubby little urchins. Never wore shoes either. Loved this post and the pics within. The pic of you with your dad and your mom’s caption is wonderful. Your post has inspired me to take up a scanning project of my own now. Not too many pics of us as kids though..still whatever there are should be good. Hooray!!! I had way more fun than I had imagined when I started actually scanning. Don’t know why I procrastinated for so long! I was very pleasantly surprised to find all my Mom’s notes on the backs of many photos, since they’d been in an album I didn’t know they were there. Lovely pictures and wonderful comments. God bless your family. Thanks Hildebrand :) Right back at you! What an amazingly heart-warming post this is from you, Greta ! It, together with the one you wrote a while ago about your mom describing her experience with your dad in a wheelchair, is really wonderfully special ! You seem to have had a lot of good and loving times in your childhood, especially with your parents and siblings. Although not quite having such an international African experience, I consider myself lucky too to have had a wonderful childhood too. Grew up in verdant surroundings with loving siblings and parents – would not trade that for anything !!! Was fantastic to read about your childhood days, Greta. The pics – and comments – are lovely too. Thanks for sharing with all of us. I am so pleased (and not surprised given how supportive you guys always are) that you’ve enjoyed my trip down memory lane (unpaved). I will tell my parents what you said (they already know it though!) :-) Glad yours was a happy one too—maybe you can write about it one of these days on your blog! 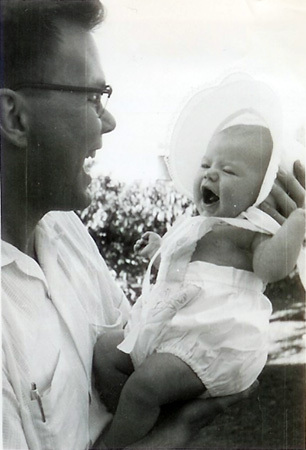 Clearly, that smile (from picture 3, with your dad, when you were a tot of a few months?) was something you were born with and it hasn’t changed! I echo Raja–kudos to your parents. And hee on ‘cooking the clutch’ :-D But why have you been modest about your artistic skills? Drawing circles was just the start. If you were asked to give this post some music, which piece would you choose? I would suggest ‘Bachapan Ke Din Bhi Kya Din The’ from Sujata (1959). Two votes for the same song! :) Must be the one! I’d also be tempted to say that it should be mbira music from Zimbabwe. My dad was an ethnomusicologist and taught music. One of his students/colleagues was Dumisani Maraire, who went on to make quite a career for himself although he sadly died pretty young. They are different songs with different themes. ‘Bachpan Ke Din Bhula Na Dena’ is from Deedar (1951). Oops! I wonder how many songs are named “Bachpan Ke Din…” :) I will read more carefully next time rmb! And Sunil—beautiful song, very sweet. Cry-worthy indeed. I understand completely what you mean about your father. I’ve felt about the same since my father had his stroke a dozen years ago. LOL@lack of dupattas. You are making up for lost time now, with your penchant for old Indian film dancing and music! Very How did you manage to dig that deep a hole in that last screen cap. Thats a lot of work!! I am also happy to see that there actually is a stage in the life of a woman when she doesnt care that much for shoes! It took quite a while to dig that hole. It’s a commentary on how little supervision we had while playing outdoors (it was a simpler time, I guess). The comments on this post are so lovely too! Bollyviewer: We lived in the city but like memsaab, were always “sent out to play”, many times in empty plots of land in the neighbourhood. I think all that sand we tunneled through was from when someone was constructing something, a “gadda” would come and dump some for the mortar. Someone was always building something. 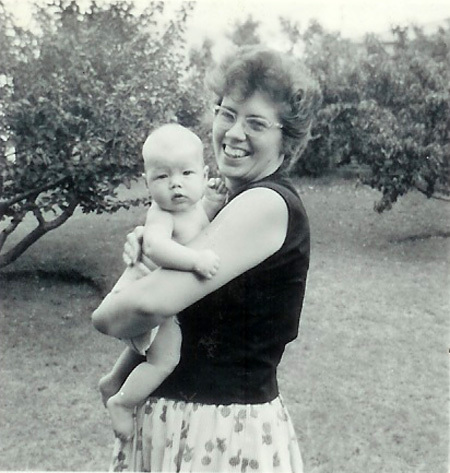 I have photos of my mum even as a baby and Dad had quite a few but his were all lost in some incident. A few years ago, on my parents 40th wedding anniversary, my sisters took an old photograph of my parents taken a few months into their marriage and then “commissioned” a painting from an amateur painter who works in the office. Greta! That is the cutest thing I’ve seen on the internets in a long time! And I go surfing for kitty photos! This reminds me that I need to scan old photographs myself although none of mine looks this amazing. There are some old ones of my mother that do look great though. Grrr, why did they invent color in time to ruin my photos? I would probably get along really well with your clutter-free mother – maybe we could switch?! And I don’t blame your father for refusing to get in that wheelchair of doom. Your mother is probably closer to my age than you are, LOL! Guess there was some benefit to childhood in the dark ages. I’d love to see your family photos—I always think when I read posts about your family how similar we all are! The clutter thing seems to skip every other generation, doesn’t it? My sister and I are both highly tolerant of it (my brother has a wife to control whatever penchant he would otherwise have). Hey!! My mom is really smart too! :-D But he did get a lot from my Dad, including his genius and the ability to block out everything going on around him! Aww..lovely photos memsaab! You had such a fun family – I remember hours pf playing in the dirt (grew up in Bangalore in the 70s, when it was a peaceful, cool place! ), someone usually had to come hunt for us at the end of the dat along the street – those days of no supervision seem so distant now! Just returned here after a gap of nearly a week to find this here!!!! In the second picture (the first black and white picture) you resemble your mom very much (as seen in a picture of yours here). The comments are lovely and I’ve enjoyed reading this post very very much. Hope you had a lovely holiday (if you were off celebrating Diwali) :) I do look very much like my Mom now, although for a long time everyone said I resembled Dad. The comments are lovely, I agree—they almost always are the best part of any post on here! dhanno says: i love this article. the picture of you and your dad got me emotional too as im the emotional types. but i love all the pictures and im sure i want to read you some more. banno: I came back too from Diwali holidays, really, really glad I didn’t miss this post. What lovely pictures. Felt like you were back in India, and we were having a long chat in the afternoon. Awwww! Dhanno I am very happy to hear from you!! Do stop by more and let me know how you are doing. Hope to see you again soon! And your head doesn’t look big it looks beautiful. Your photos look like the ones, which middle class families in india hung in their homes in form of posters, with some meaningful quotes below it! You are nice, harvey, as usual! Oh YES. I’d forgotten about this song (I don’t really love Aradhana, I have to admit). It’s such a lovely parent-child song…thanks for reminding me of it! This was a very sweet article. Great pictures too. Sadly, I know what it’s like to have a relative go through dementia. My great grandmother used to be the adult in my family who always had to spank me for being evil (because frankly…I was rather a little satan’s spawn as a child) and I regret now all the times I made her life miserable, seeing her gradually fall apart. Especially because she might have been a disciplinarian, but she also always cut the crusts off my sandwiches, and was for a good deal of time the only adult who would give me the time of day as a child. Again, beautiful pictures. Sweet stories. Absolutely lovely post! Really enjoyed looking at those photographs. Growing up in Rhodesia must’ve been fun, although I daresay it’s no longer much fun for people living there. Saddened to hear about your dad. It can’t be easy, watching someone go like that. I wouldn’t trade my childhood for the world :) Thanks re: Dad…it is hard sometimes, but he and my Mom both have great senses of humor and we all laugh a lot together.